The weeks and days leading up to your child starting primary school can be daunting for many parents. We want to know that we have done all we can to get them off to the best start possible! When your child does begin school, their teacher will be focusing on building a range of skills. There are a few important area’s parents and early childhood educators can focus on to support a child’s skill development at primary school. Below we have explained our top foundation areas to target and some great tips to support your child’s school readiness! Adequate finger and hand strength and being able to coordinate hand and finger movements is important for using pencils, scissors, grasping or manipulating objects, tying shoelaces and managing buttons and zips. All of which is important for school readiness! Visual skills is not just about what you see, it involves being able to focus and attend to tasks, track from left to right when reading, and to coordinate a motor movement in response to what you see (eg copying letters, or bouncing a ball, or playing games). Another important foundational area for school readiness! Time certain tasks using a visual timer (e.g Time Timer app, bubble or egg timers or stopwatches. You can slowly increase the amount of time spent on a task, increasing their visual attention. Drawing helps to improve pencil control, shape formation and visual motor skills (i.e copying what the eyes see). Drawing skills are an important prerequisite for handwriting. It is important that a child is able to copy these shapes before moving on to the more complex task of learning letter formation. Use a whiteboard to draw and copy shapes before moving on to pencil and paper. Use window or shower crayons to practice drawing houses on a glass door or the shower screen. Practice drawing in the sand at the beach (large shapes are often easier to copy than small shapes). Use thicker triangular pencils instead of the standard thinner pencils. This will increase the ability to control the pencil more efficiently while supporting a developing pencil grasp. Give your child fun and basic dot-to-dot or maze worksheets while you’re getting lunch or dinner ready. 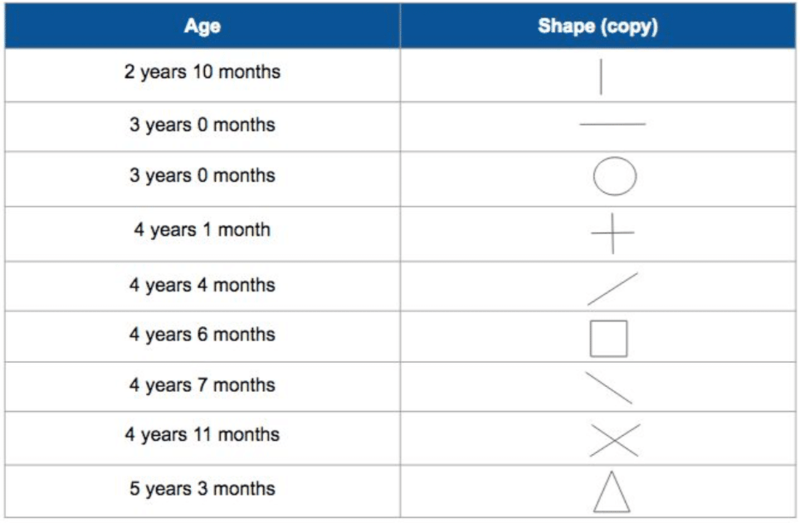 Take turns with your child drawing different shapes. Start with the child tracing over a shape and then use dot points (see below). Self care skills are important for starting school to ensure your child is able to be as independent as possible both at school, at home, during school excursions, or when visiting friends houses. Independence builds self confidence. We want our child to feel confident at school and while developing their skills! Practice buttons, clothes, shoelaces, shoes and socks, zips. Dressing toys is a great place to start. It’s also helpful to practice opening containers or packaging, and peeling bananas. When learning a new skill, teach the last step first. Completing the task and allowing your child to complete the final step builds a sense of success. As their skill improves, you can increase the number of steps your child completes. Some self care skills require increased hand and finger strength and the fine motor activities above may assist with improving independence in these areas. Setting up a reward system at home for completing tasks independently. A visual schedule or a chart helps to build independence. Keep it short, simple and easy to follow. Getting ready for the day earlier to ensure there is enough time for the child to complete or practice activities during the morning routine independently. Correct posture when seated at the table can affect a child’s speed, quality and neatness of their handwriting. It requires good trunk and shoulder stability, and can impact a child’s ability to sit for extended periods. Implementing animal walks into the family routine to help strengthen shoulders, arms and hands. For example, bear crawl or crab walk to the dinner table, bathroom or bedroom each night. 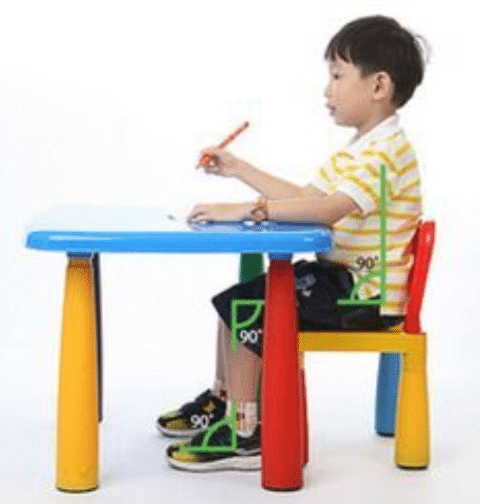 Make sure when writing or drawing at the table that feet are flat on the floor (or on a foot stool), back is supported and the table is at an appropriate height (see below). Paint or draw vertically (on a chalkboard or paper on the wall) to increase shoulder strength and wrist positioning. Do activities while laying in their belly, resting on their elbows to increase shoulder and neck strength. If you have any concerns about your child’s development, we encourage you to speak with your child’s educator or contact us at Empowered Kids to speak with an occupational therapist about any concerns or questions you may have.